Not the greatest picture, but you get the atmosphere. 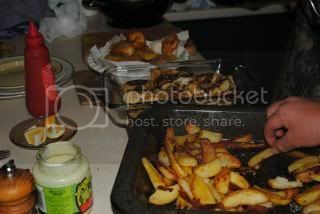 The lads went fishing today, so we had a feast of snapper and home made chips with garlic aioli. Half the fish went on the barbeque and half got battered and shallow fried. It was a family bedlam - all the grand children, all the sons and daughters and food galore. Now you might understand how fresh fish night is really a 'special' meal - it is a totally relaxed casual affair. No tables or fancy serving, just great 'Kai' (food) with people you love. Those are the best kind of meals. I'm liking! Looks like a few meals that we have had in our home after a day of fishing or hunting. Great family time! Yea, that brings back some memories!! So simple and so good .